Explanation and punishment | Russian Legal Information Agency (RAPSI). Proposed legislation in the State Duma would hold officials criminally liable if their standard of living does not conform to the income they officially declare. The fact that the bill has been drafted and submitted by Communist deputies has led many observers to doubt that it will become law: anti-corruption initiatives by members of the Communist Party have seldom met with a positive response from the rest of the deputies. But the fate of a bill cannot be preordained on the basis of its authors’ party membership alone. To begin with, anti-corruption rhetoric is a key theme in public statements made by the country’s leadership (though the efficacy of the measures taken is arguable). Therefore, it is quite possible that even if this bill does not pass as written, its main ideas will resurface in another bill submitted on behalf of the president or government, or a larger Duma party. The bill would add a new article on “illicit enrichment” to the Criminal Code. Illicit enrichment is defined in the bill as “the acquisition by a public official of property whose value significantly exceeds his or her lawful income, and whose source he or she cannot reasonably explain.” In other words, officials are obliged to explain the source of income used to make expensive purchases. ‘Significant’ is defined as 500,000 rubles or more. There is also illicit enrichment on a large scale (no less than one million rubles) and illicit enrichment on an especially large scale (over one million rubles). In the event of significant illicit enrichment, the punishment involves up to five years imprisonment and seizure of the property in question. The possible prison term for large-scale illicit enrichment is seven years, and for especially large-scale enrichment it is 10 years. In an explanatory note to the bill, the authors cite an article in the UN Convention Against Corruption dated October 31, 2003, which urges establishing as a criminal offense, when committed intentionally, illicit enrichment, that is, a significant increase in the assets of a public official that he or she cannot reasonably explain in relation to his or her lawful income. Russia joined this convention in 2006. In principle, one cannot deny that criminal punishment for illicit enrichment is a sensible and rather efficient tool in the fight against bribery. It is quite likely that this is exactly what was missing in another anti-corruption measure – mandatory income declaration by officials. Declaring income makes no sense by itself. It only means something if the declared amounts and sources are verified and found to correspond to the real spending by the public official concerned. This is where income declaration breaks down in Russia: no action follows the submission of papers. Perhaps the way to fix the process is to monitor whether officials’ spending lines up with their declared income. Unfortunately, however, despite the positive effect it could have, the bill cannot be passed in its present form. “Reasonably” and “in good faith” are, of course, terms in civil law. But the cases in which these terms apply and are decisive are few and far between. In Russia, persecutors will have to prove every time why the explanations given for purchases are not “reasonable.” Obviously every defendant will try to give some justification. Also, the authors of the bill were surprisingly careless when defining large-scale and especially large-scale illicit enrichment. 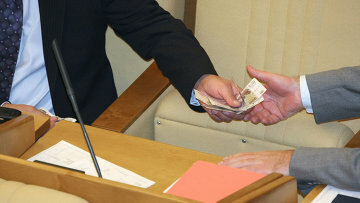 It will be recalled that illicit enrichment on a large scale involves “no less than one million rubles” while illicit enrichment on an especially large scale involves “over one million rubles.” It goes without saying that the difference between the two is one kopeck, for in the first instance the counting starts with 1,000,000 rubles 00 kopecks and in the second, with 1,000,000 rubles 01 kopeck. It is these seemingly technical but really very significant details that doom this bill. Party membership in this case is irrelevant.